The Mother Theresa Hackelmeier Memorial Library maintains a collection to support the learning experiences of the students and the teaching and research activities of the faculty and staff of Marian University. The primary focus of the collection is on materials that serve the undergraduate and graduate curricula. In order to support this mission, the Library houses approximately 100,000 print volumes as well as database subscriptions providing students online access to a variety of scholarly titles beyond the Library’s print collection. Materials not held in the collection may be requested via the Library’s InterLibrary Loan Department free of charge. A variety of study options are available in the Library including individual study carrels, 3rd floor Quiet Area space, several group study spaces, and general areas for individual or group work. For Marian University affiliated users bringing mobile devices to the Library, wireless network access is available throughout the building. The building also includes an electronic instruction lab equipped with computers for interactive teaching. Mother Theresa Hackelmeier Memorial Library is staffed with highly trained, professional librarians available to assist students in their research endeavors and to instruct individuals or entire classes in the most effective and efficient research applications available in today’s academic library. In person, email, and phone reference assistance is available to all Marian students and faculty. Drinks are allowed in most areas of the library. A covered container must be used. Patrons are liable for any damage to library property and equipment caused by food and drink. Patrons are asked to leave a ‘no trace’ approach to their use of food and drink in the library. Patrons are also asked to dispose of trash properly and be considerate of fellow students. The use of tobacco products is prohibited on all of the Marian University campus. The use of alcohol in the library is prohibited. Your Marian ID Card is also your library card. It can be obtained from Campus Police located in the Ruth Lilly Student Center. The copyright protections that are normally associated with print also govern the use of audio, video, images, and text on the Internet. The intuitive interface of the Internet make it easy for the computer user to copy and use images, text, video and other graphics that are likely to be protected by copyright. A document may be copyrighted even if it does not explicitly state that it is copyrighted. Educators can avoid copyright violations and legally use copyrighted materials if they understand and comply with the fair use guidelines. Found personal items may be turned in to the front desk of the library. Items are taken to the Marian University Police in RLSC on Fridays. Missing computers, mobile devices, and wallets are taken over the day they are turned in to us. We will try to contact individuals when ownership is easily identified. Users may check out an unlimited number of books, but only 3 DVDs/CD/Games at a time. With an item loaned to a user's account, email notifications will be sent to the user in several phases. The first phase will indicate the item's upcoming due date, the second indicates the arrival of the due date, the third will indicate accrual of overdue fines, and the fourth will indicate that the loaned item has been deemed lost. Return the item: replacement fee is waived, but overdue fees remain. Pay replacement fee of the item at the Business Office. Purchase a replacement for addition to the library collection. Note: consultation with library staff is necessary prior to replacement purchase. Note: If a user loses a PALShare item (item borrowed from our consortium partner), the library will be charged a flat $75 fee for replacement (regardless of format), which will then be forwarded on to the user to recover costs. It is highly encouraged that students first consult the library when reconciling items marked as lost. 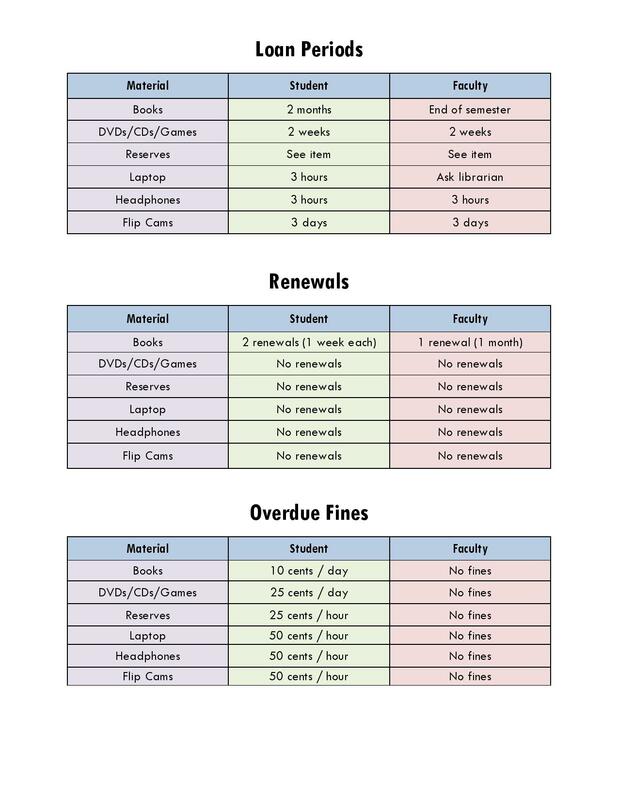 Students are ultimately responsible for their overdue fees.